Photo by Becca Petersen and Becca Petersen | The State Press Cartoon illustration done on Wednesday, March 30, 2016. In the final week of March, Tempe Undergraduate Student Government's election season brought campaign drama to a head, with one candidate who said he lost faith in the University's student government system and another who dropped out of the race after complaints against his campaign opened a school investigation. The Tempe USG election season quickly descended into a melee — the likes of which are usually associated with controversial, national elections. The Human Campaign — headlined by Grady Eldridge, Kevin McCawley and Julia Deitz — withdrew its ticket following a complaint and pending Arizona Board of Regents hearing concerning an allegation of the presence of alcohol at a fundraiser hosted by the ticket, presidential candidate Niko Vlastos said. Although the complaints against Eldridge's campaign have since dropped because of its withdrawal, the investigation and trials will continue. Eldridge said he initially wanted to throw his hat into the ring because he did not see enough philanthropy within student government. He said his experience this campaign season has led him to believe there is no place for altruism in USG. "The USG political scene is absolutely cutthroat," Eldridge said. Eldridge endorsed the DeGravina ticket after he dropped out and expressed frustration with current USG President Isaac Miller's endorsement of the Bishop ticket. Miller said he understands if candidates are upset with his endorsement, because he did initially say he would not endorse someone. However, he said it was an indication that he would not endorse someone at that moment. "Toward the beginning of the campaign, we were't really looking to endorse anyone," he said. "But then, as campaigning went on, I'd say that my team and I had ... realized we were leaning in the same direction." Miller decided to endorse Bishop after reflecting on that, he said. "The other tickets are not wrong to think we were not looking at endorsing someone," Miller said. "When we as a team felt like we were all leaning in the same direction, that's kind of the point when we decided to speak about it." At the beginning of the election season, all of the candidates met and agreed to operate an "above-board election," Eldridge said, in which the candidates would be helpful and amicable with one another. Within the next few days, the Bishop ticket and current president Miller lodged complaints against Eldridge's ticket. "The candidates all shook my hand and agreed not to play dirty, and then in a few days, that was broken by the Bishop ticket and certain endorsers," he said. "Their word doesn't mean anything." Presidential candidate Niko Vlastos expressed similar frustrations with the political process on campus. Vlastos is an outsider to Tempe USG, as he does not have prior USG experience. His candidacy came as a result of his experience on the gymnastics team, where he said he did not feel USG appropriated enough funds toward the club. "I was on the gymnastics team for two years and we didn't really see any support from USG," he said. After that, he decided he would fix the problem himself. Vlastos said he thought the election process would be above board and fair. Instead, he said it was a nasty and overly competitive process. Vlastos said those currently in office are too willing to become dishonest in their pursuit of politics. He said current Tempe USG President Isaac Miller told candidates he was not interested in endorsements or helping anyone win the election. In light of his own experience, Vlastos said the system of USG is broken, though it is not beyond repair. He said he believes increased transparency and a dedication to student needs would bring the system back to what it should be. Presidential candidate Aundrea DeGravina said she believes the system is also broken and not beyond repair. "Our ticket said we think we're operating in a broken system," she said. "That's not a critique on the administration that's in there currently." DeGravina currently serves as the chair of Tempe USG's appropriations committee, and said her experience in that position has granted her the knowledge of USG's limits and capabilities. "We know what we're capable of," she said. 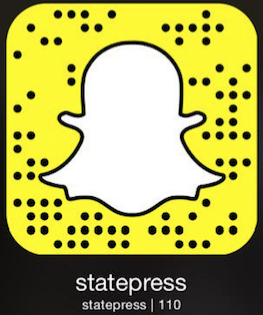 "When you promise things you can't, students get discouraged from student government." In the same vein, a student who created a code for an "I voted DeGravina" Facebook profile photo filter for the DeGravina campaign accused the Bishop campaign of stealing the code for the filter in a Facebook post. The Bishop ticket responded in a Facebook post of their own, which said any impropriety was unintentional. 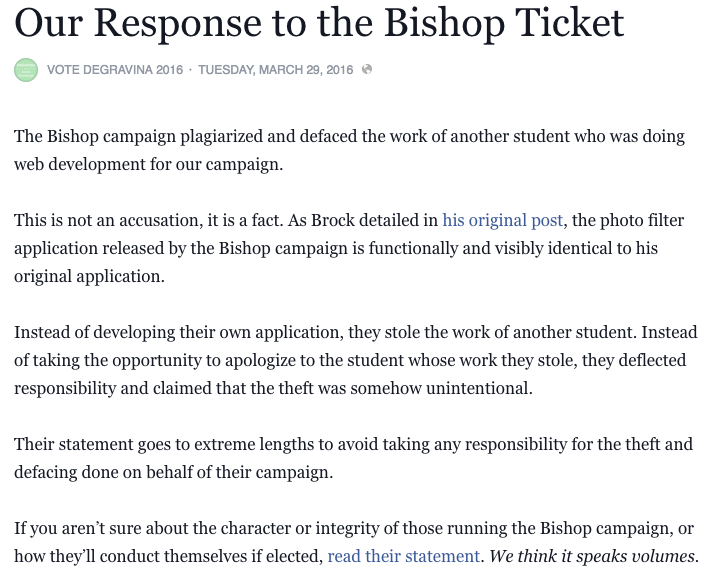 The DeGravina ticket then issued a response to the Bishop ticket on Facebook, saying that they committed plagiarism, regardless of their intentions. Amid flying accusations and Facebook posts, DeGravina said the election is not as aggressive as it would appear to be from the outside. Rather, competition serves to improve all the candidates involved in the race, she said. "Competition makes people better," she said. "They need to push back on me, and I need to push back on them." However, DeGravina said tickets need to make a conscious effort not to grapple for low-hanging fruit. "It makes tickets better as long as they don't stoop too low," she said. Presidential hopeful Brandon Bishop said he wants to ensure students feel represented and treated equally by their USG representatives. "We want to have a healthy relationship with the senate," Bishop said. "Making sure every organization feels they're being heard on campus." Prior to the election's results, he said he wanted to make sure he followed up on campaign promises and would not forget about them if he had been elected into office. "I think there's a lot of students and student organizations on this campus that feel a little disenfranchised — that feel USG hasn't given them the proper attention that they needed, and I think a lot of ... students in general don't feel that they see the benefits of funding USG," Bishop said. He added that the Tempe USG elections were more competitive and aggressive than the candidates initially thought they would be. "I didn't expect it to go this far," he said.